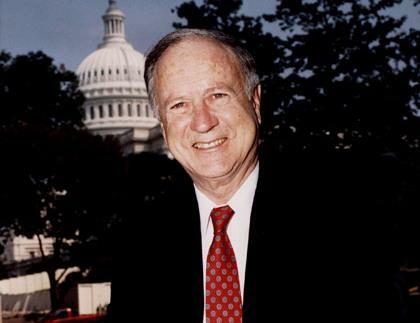 Former U.S. congressman, Arkansas Supreme Court justice and university president Raymond "Ray" Thornton died early Wednesday, his former chief of staff says. He was 87. Thornton was in hospice care for lung cancer in Pulaski County. The Conway native graduated from Yale University in 1950 and a few years later served in the Navy during the Korean War. Thornton then earned a law degree from the University of Arkansas School of Law. He entered the political arena in 1970, winning the position of state attorney general. That was followed by three terms in the U.S. House of Representatives for the fourth congressional district. He served on the House Judiciary Committee during the Watergate scandal. The Encyclopedia of Arkansas notes his contributions to the investigation of President Richard Nixon. "Thornton also served on the House Judiciary Committee, which investigated the June 17, 1972, Watergate break-ins. In July 1974, six members of the committee met and began to draw up draft articles of impeachment. Thornton’s three articles indicted the president for abuse of power, obstruction of justice, and continuing to show contempt for Congress. The substance of Thornton’s draft was approved, and the articles were immediately submitted to the full Judiciary Committee, which, after some amending, passed article one—obstruction of justice—on July 27, 1974, and the other two articles—abuse of power and contempt of Congress—by July 30. With the “smoking gun” tape becoming public, as well as the upcoming vote in the House to accept the Judiciary Committee’s impeachment articles and his loss of congressional support, Nixon resigned on August 9." In this 1994 Watergate retrospective panel, Thornton said he considered Nixon to have committed “high crimes.” He said drawing up articles of impeachment as a member of the committee ran counter to the will of many constituents in the fourth district at the time. “I thought that this was a circumstance in which my duty was to the whole country, rather than to reflect the 70 percent majority of my district which had supported the president,” Thornton said. He did not have a general election opponent that year. The impeachment articles for obstruction of justice, abuse of power and contempt of Congress did prompt the resignation of the 37th president. "I saw [the Judiciary Committee's] role as being in the position of being the safety valve as to whether this free government would continue to exist," he said. Thornton left office in 1978 after a failed bid for the U.S. Senate, losing to David Pryor and Jim Guy Tucker in the Democratic primary for the open seat that had been held for decades by John McClellan. Following the loss, he left politics for a time and served as president of Arkansas State University and later at the University of Arkansas in Fayetteville during the 1980's. In 1990, in an uncommon feat, Thornton ran for Congress again, this time in the second congressional district. He stayed in the position until 1997 and was succeeded by fellow Democrat Vic Snyder. Thornton was then elected to an eight year term on the Arkansas Supreme Court. He was a member of the court that reasserted the unconstitutionality of the state education system in the landmark Lakeview case. As a result, the court ordered the Arkansas Legislature to revamp the way state schools were funded. In 2009, he served as the first chairman of the Arkansas Lottery Commission. “I know of no politician or really no one in public life in Arkansas who’s had such a long and diverse career in academics and state and national politics. He kind of did it all,” says veteran journalist and political columnist Ernie Dumas, who conducted an oral history interview with Thornton for the Arkansas Supreme Court Historical Society in 2013. Dumas says Thornton was also a champion of environmental issues during his tenure in Congress. He chaired the House subcommittee on Science, Research and Technology during his term in the '70s and again in the '90s. Hal Bass, a political science professor at Ouachita Baptist University, says Thornton was a centrist. During Thursday’s session of the Arkansas General Assembly, a moment of silence was held to honor of the late Congressman on the House floor. Other Arkansas politicians are expressing their appreciation for Thornton. I join all Arkansans in mourning the death and celebrating the life of Congressman Ray Thornton, a pillar of political and educational life in Arkansas. Whether it was during his tenure as President of both Arkansas State University and the University of Arkansas, representing two congressional districts, or serving as a Justice on the Arkansas Supreme Court, Ray leaves a lasting legacy of selfless service and principled leadership. My thoughts and prayers are with Congressman Thornton’s family and friends. Congressman Ray Thornton led a distinguished career that benefited Arkansas from public service as an elected official to leading our state’s top universities. His dedication to the people of Arkansas leaves a lasting impact. I join with all Arkansans as we mourn the passing of Congressman Thornton and keep his family and loved ones in our thoughts and prayers. I am saddened to hear of the death of one of Arkansas's great leaders, Congressman Ray Thornton. I remember hearing my grandfather, John Tull from Lonoke, speak highly of him and the work they did together. Congressman Thornton left a lasting legacy on the people and the quality of this state. As a congressman and through his time spent at multiple universities, he inspired us all with his dedication to public service. Congressman Thornton will live on in our memories. I was greatly saddened to hear about the passing of former Congressman Ray Thornton. Ray was an Arkansas gem who passionately served the people of this state for many years. He was a man who had a genuine heart for the people of Arkansas. Every time I saw Ray, he had a smile and a word of encouragement. He will be greatly missed, and my heart goes out to his family and loved ones. Congressman Ray Thornton was a gifted politician and statesman whose work reached across Arkansas. Twice a congressman, he took a stand for justice during one of our nation’s most trying times as a member of the House Judiciary Committee. Between his two tours of service in the House, Ray made his impact in higher education not only in Arkadelphia, but also in Fayetteville and Jonesboro. The universities he led turned out thousands of men and women who have made a lasting impact in too many fields to mention. Though he retired from higher education and Congress, Ray’s dedication to the Natural State continued with his service on the Arkansas Supreme Court. His life was one of service to his fellow man and dedication to his state and nation. I was saddened this morning to hear of the passing of Ray Thornton. Ray was a long-time dedicated public servant who served Arkansas in many ways, including as attorney general of Arkansas, a United States congressman, justice of the Arkansas Supreme Court, and president of both Arkansas State University and the University of Arkansas. His legacy is inspirational to the next generation of leaders. Martha and I extend our deepest condolences to the family of former Arkansas Congressman Ray Thornton. As a veteran of the Korean War, a Congressman, a state Supreme Court Justice, and an educator, Ray dedicated his entire adult life to service of our state and nation. He was a true gentlemen and an outstanding leader who used his drive, wit, and energy to represent our citizens and improve higher educational opportunity for our young people. Though he will be greatly missed by many throughout Arkansas, his countless contributions will live on for many years to come. Arkansas. Our thoughts and prayers are with his family during this difficult time. John Paul Hammerschmidt, the longtime Arkansas congressman who defeated Bill Clinton in the former president's first race for political office, has died. He was 92. Hammerschmidt spent two decades in Congress before retiring in 1993.The Roller-Christeson Funeral Home in Harrison confirms that he died early Wednesday. Funeral arrangements are pending. Former Congressman and Arkansas Supreme Court Justice Ray Thornton is donating his personal and professional papers to the University of Arkansas Libraries. Thornton is a graduate of the University of Arkansas School of Law. He was elected Arkansas' attorney general in 1970, and later served three terms in the U.S. House representing the 4th Congressional District. During his term, he served on the House Judiciary Committee that investigated the Watergate burglaries and drafted the articles of impeachment against President Richard Nixon.